The Grand Canyon National Park Silver Uncirculated Coin is the fourth in a series of five ounce collectible silver coins by the United States Mint. This uncirculated coin honors Grand Canyon National Park located in the state of Arizona. The uncirculated coin is a numismatic version of issues released at a part of the Mint’s America the Beautiful Silver Bullion Coins Program. Together, along with the circulating America the Beautiful Quarters® Program, the three series honor selected sites of national interest from around America, the District of Columbia and the five US Territories with designs on their reverses. The precious metal coins are struck from five ounces of .999 fine silver. The 2010-dated issues, like this one, feature a diameter of three inches and have the weight and fineness of the coin edge inscribed. That diameter was initially required of the bullion coins, but had later been modified to allow diameters of between 2.5 and 3.0 inches. Despite the relaxed diameter requirements, the Mint has opted to remain with 3 inches. 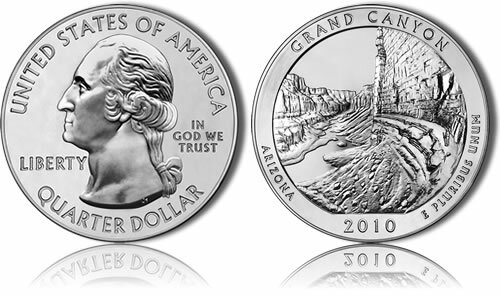 These Grand Canyon Silver Uncirculated Coins were released to the public on June 29, 2011 at a price of $279.95 per coin. Demand was high, albeit somewhat less than had been seen for some of the previous three strikes of the series. It took until the end of the next month (August) for the Mint to place the future orders for the coins on a waiting list (indicating the entire mintage of 27,000 had been sold). A portrait of George Washington is shown on the obverse of all the coins. It was designed by John Flanagan and first featured on the 1932 circulating quarter dollar. Also shown are the inscriptions of UNITED STATES OF AMERICA, LIBERTY, IN GOD WE TRUST and QUARTER DOLLAR. On the reverse, an image of the granaries above the Nankoweap Delta in Marble Canyon is shown. It was designed by United States Mint Sculptor-Engraver Phebe Hemphill and also includes the inscriptions of Grand Canyon , Arizona, 2010 and E PLURIBUS UNUM. The Grand Canyon runs for 277 miles along the Colorado River which was responsible for cutting the massive canyon over eons. At times it reaches depths of over a mile and is up to 18 miles wide in locations. The national park set up to protect the canyon is over 1.2 million acres large and receives an estimated 4 million plus annual visitors. The Grand Canyon went through several stages of government protection before finally attaining the national park status. It started in 1893 when President Benjamin Harrison created the Grand Canyon Forest Preserve. President Theodore Roosevelt added additional protections by declaring it the Grand Canyon Game Preserve in 1906 and the Grand Canyon National Monument in 1908. Finally, President Woodrow Wilson signed the Act proclaiming it a national park in 1919. Edge: ".999 FINE SILVER 5.0 OUNCE"